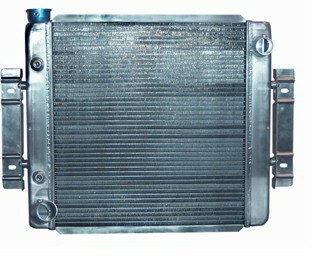 The Ford style universal fit radiators feature an upper right inlet and a lower left outlet. They will work with any engine, however you will find these radiators more convenient if your hoses already attatch to the same locations. These radiators feature a 7 plate all aluminum high performance transmission cooler and can be used in either manual or automatic vehicles. Ford style universal fit aluminum radiator - 19.68"H x 22.82"W.
Ford style universal fit aluminum radiator - 19.68"H x 25.03"W.
Ford style universal fit aluminum radiator - 19.68"H x 26.57"W.
Ford style universal fit aluminum radiator - 19.68"H x 28.32"W.
Ford style universal fit aluminum radiator - 19.68"H x 32.07"W.
Ford style universal fit downflow radiator - 27"H x 19.75"W.
Ford style universal fit downflow aluminum radiator - 26"H x 16"W.
Ford style universal fit downflow aluminum radiator - 20"H x 25"W.